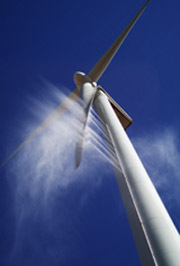 BladeCleaning emerges as the answer to the power loss -and so production and income- due to the accumulation of dirt in the wind turbine's blades. Whether you are interested in a phenomenon that affects thousands of turbines around the World or you have detected a decrease in the performance of your wind farm, in this website you will find all the information related to the effect that dirt (flying plankton, mosquitoes, oil, ice, dust, marine salt, etc.) produces over the aerodynamic behavior of the wind turbine, causing an economic impact over the wind farm owner, stability problems on the national power system and warranty issues on the operator. On the About and Contact sections you will find information about BladeCleaning and how to get in contact to ask for more information or to answer any question you may have about the pioneer blade cleaning system that does not need to stop the turbine to clean it.